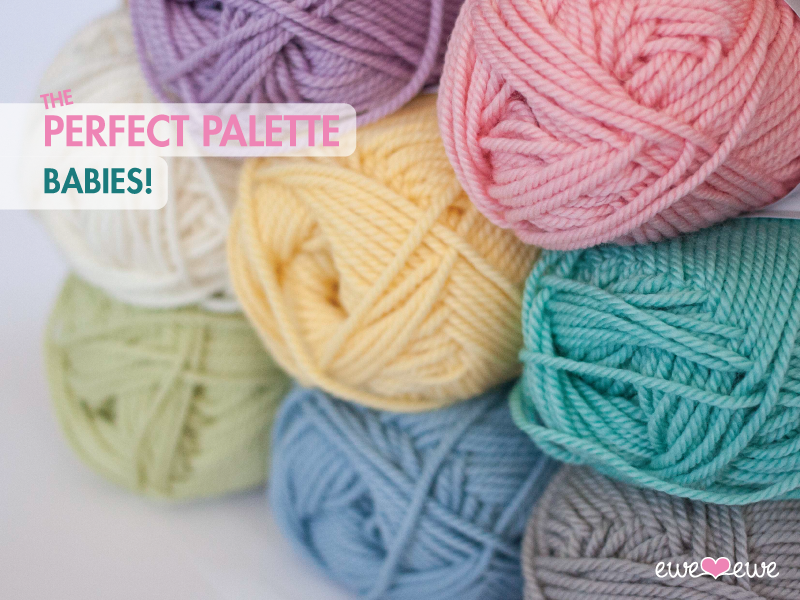 Wooly Worsted yarn comes in 20 bright and fun colors so we decided to add a new blog column called The Perfect Palette. Each week we'll pull together a collection of Wooly Worsted yarn colors to get your pique your creativity. Sounds fun, right? We hope so! This week is babies! Wooly Worsted is the perfect yarn for easy care kids clothes. The washable merino wool yarn is soft against the skin and since it's superwash it can be washed by that tired new mom who isn't thinking clearly just yet. Here's some of our favorite Wooly Worsted shades that will work for boys, girls or that mystery baby that needs a shower gift! Any combination of these yarns would make a hip and sophisticated baby blanket or cute sweater. Try the Sweet Pea Baby Blanket knitting pattern or maybe the Easy As ABC Top-Down Sweater. Fun! Click here to see our Baby & Kids knitting patterns.